Lunar Dragon is a bullion gold coin minted by the Perth Mint in 2012 when was celebrated the Year of the Dragon by the Australian Lunar Gold Proof Coin Series II. The dragon is the fifth from twelve animals belonging to the Chinese zodiac. So these illustrations on the bullion gold coins minted by the Perth Mint have taken place for 12 years. The Lunar Dragon is issued as legal tender in Australia under the Australian Currency Act 1965 and each coin is accompanied by a certificate of authenticity. In 2008 the illustration was a Mouse, a Buffalo in 2009, a mighty Tiger in 2010, 2011 was the year of the Rabbit, and in 2012 it was the turn of the Dragon. There will also be future editions of the Chinese inspired coins as the years pass by: in 2013 a Snake, then a Horse, a Goose after that, in 2016 an Ape, 2017 will be the year of the Chicken, a Dog in 2018, and lastly in 2019 will be illustrated a Pig. The Lunar Dragon is produced in a variety of denominations like: 1oz Lunar Dragon with a weight of 3.11 g pure gold, 1/2oz with the corresponding weight of 1.55 g, 1/4oz, 1/10oz, and 1/20oz. Therefore, investors and collectors have where to choose from. 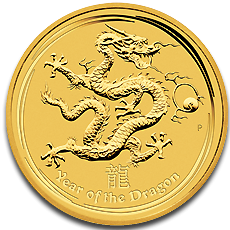 Each Lunar Dragon coin has a purity of 24 carat or manufactured from 99.99% pure gold. The 1oz Lunar Dragon coins have been minted in numbers above 30,000. The Lunar Dragon coins can be regarded by everyone as a refined gift made of pure gold in proof quality. They are especially addressed to people born in the dragon years which are 1940, 1952, 1964, 1976, 1988, 2000, and of course 2012. It is said about the people born in the dragon year that they are independent, passionate, and enterprising, having great confidence, charismatic, natural born leaders, and brave. The perfect way to suggest these thoughts to a person is to offer them the Lunar Dragon gold bullion coins. The presentation of the Lunar Dragon gold coins is also spectacular, each coin coming in its own oval-shaped display case. The case comes in an illustrated shipper and it brings a granite effect base and a glossy timber-effect lid. The Lunar Dragon coins appeal also to investors and to gold proof collectors alike due to their low mintages. The 1oz coins facing the dragon have been issued in the limited number of 3,000 coins. The 1/4oz coins have been issued in the scarce number of 5,000 coins and the same was the case for the 1/10oz coins. The obverse of the Lunar Dragon can be regarded as a classical one for most of the Australian gold coins depicting the portrait of the crowned Queen Elizabeth II facing right, designed by Ian Rank-Broadley. The reverse, as the name of this gold coin suggests, depicts a traditional Chinese dragon which is a long and serpentine creature that has four legs. Also on the reverse it is written the word dragon in Chinese and also the words Year of the Dragon and the standard P representing the Perth Mint. These exquisite Lunar Dragon coins are available on our website at affordable prices and they come in all the denominations issued by the Perth Mint.